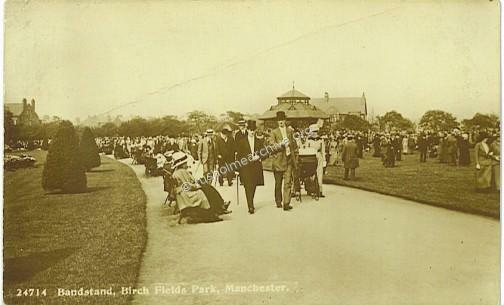 Nowadays the Park is generally referred to as Birchfields Park, but many of the postcard views shorten this to Birch Park - William Royle refers to the park as Birch Fields Park and at the opening ceremony the Parks Committee Chairman referred to the Birch Fields Recreation Ground, so I will use the present form! 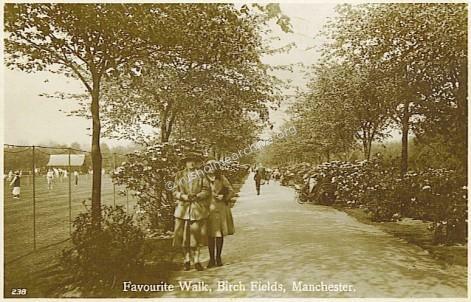 The postcard view below, (titled Birch Fields), is postmarked 1920, however I am sure it will have been photographed perhaps a year or two previously to this date. 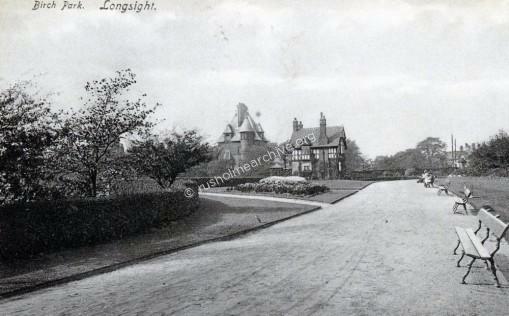 In this view, the camera is looking northward towards the 'Longsight entrance'. What is apparent is that I cannot see any men - is it the time of day? In this postcard view below dated 1909 the children are inevitably playing around the fountain. 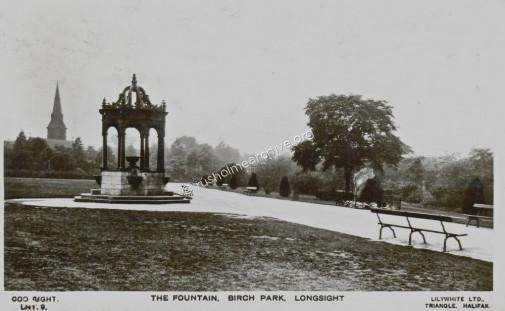 This fountain was provided from a bequest by an Alderman Clay, who left sufficient money for parks to be provided with a fountain of pure drinking water. 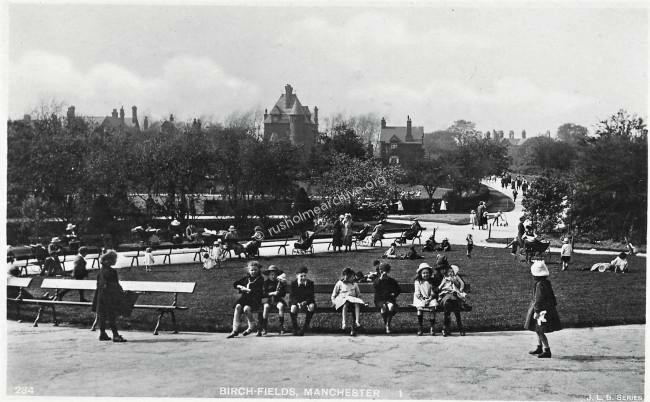 Birchfields Park was probably created as a result of the incorporation in 1885 of the old Township of Rusholme into the Manchester Corporation. 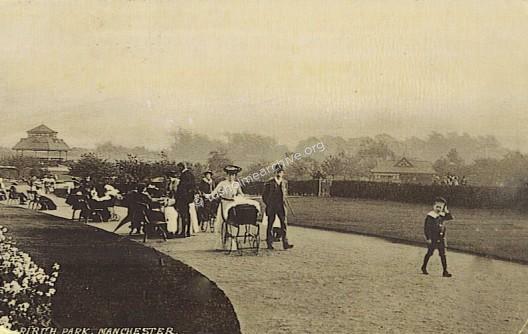 In February 1881 the Manchester Guardian reported that a large number inhabitants of the city and the neighbourhood had invited the Council to consider purchasing a plot of land lying to the south of Dickenson Road, for the purpose of a public park. The Mayor said the cost might involve considerable expenditure, perhaps £40-50,000.The principal objection seems to have been that the site in question, 'was a long way from the City'. Councillor Asquith suggested that the matter lie on the table, after further discussion it was referred to the Parks & Cemeteries Committee. Nothing seems to have come from that but in 1884 the 20 acres of land known as Potters Fields, (now Whitworth Park), was offered for sale at some £45,000. 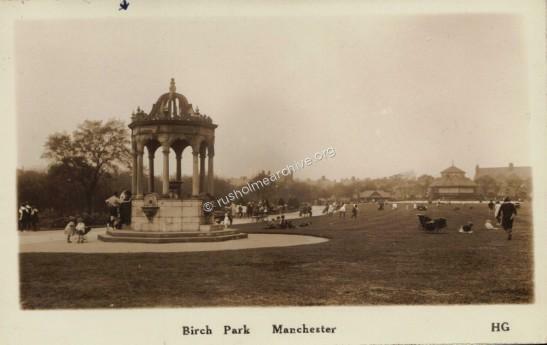 At a meeting on May 6th in Rusholme Public Hall there was substantial support for a motion calling upon the Manchester Corporation to purchase this land as a Park that could be used for the residents of the surrounding districts including Rusholme. This proposal did not come to fruition but within 12 months Rusholme Board of Health was deep in discussion (& dispute?) about being incorporated by the City of Manchester. There was perhaps understandably considerable local opposition to this proposal, but this had been partly driven by the Board of Health who were struggling with the increasingly expensive & difficult task of managing the Rusholme sewerage scheme. 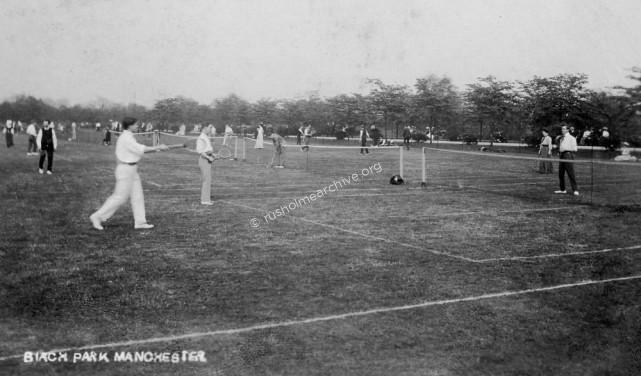 The Rusholme Board of Health had also been under pressure to provide a public park for but were also very anxious as to the possible cost; the question had also been raised as to whether the Board of Health had the powers to use the local rate for such a project. 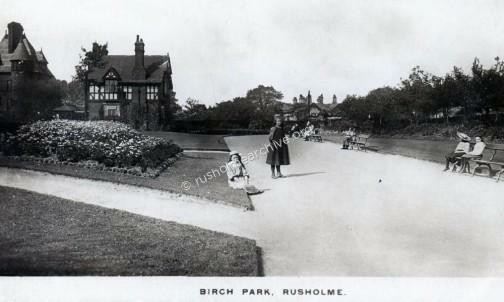 Early in 1885 an offer was made by Sir William Anson to give 5 acres of his estate in Rusholme for use as a public park. This space was known as Birch Fields and Sir William also offered to sell additional land at £400 an acre to be added to the park. 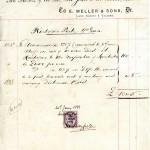 If you click on the image top left you will see that it is an invoice from Meller & Co., the land agents who handled the sale of 10 acres of land. Interestingly it is headed Rusholme Park. The Anson Trustees were also charged £170.00 towards the cost of sewering Dickenson Road. The trustees of the adjoining Richard Cobden estate also offered to gift over 39,000 sq yds of land subject to an annual chief rent of £162. Another donor, a Mr Herbert Philips freely offered just over 4 acres of land fronting onto Dickenson Road. 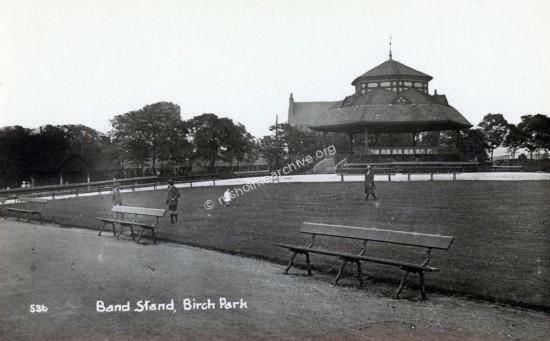 Birchfields Park Bandstand above, looking East towards Anson Golf Course; The Manchester Professional Military Band, (photo below), played regularly in the Rusholme parks and would have been here in the Birch Park bandstand. 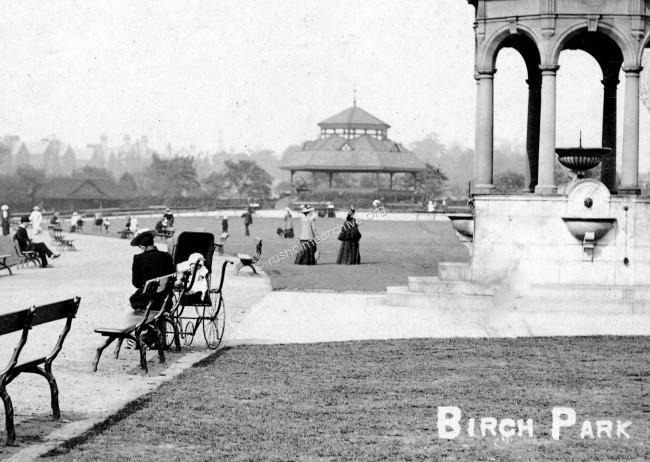 Birchfields Park history continued; As mentioned earlier the most important issue facing the Rusholme Township was the increasing cost of maintaining the sewers. It was decided that a poll should be taken and the ratepayers in Rusholme voted 893 in favour of incorporation with Manchester, there being 465 dissenting. 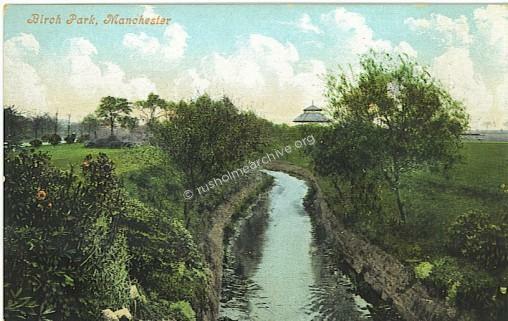 Whether some informal agreement between the Rusholme Health Board & Manchester Corporation was ever made regarding a park for Rusholme, one of the meetings of the Rusholme Board of Health in 1885 called upon the Manchester Parks Committee to accept the offer of the free land and additionally to buy at least a further 15 acres from Sir William Anson! Eventually the Manchester Parks Committee looked upon this proposal very favourably but not without some dissent. The Council nevertheless acquired the land at a cost of £7,930 and laid out the site at a further cost of £16,000. 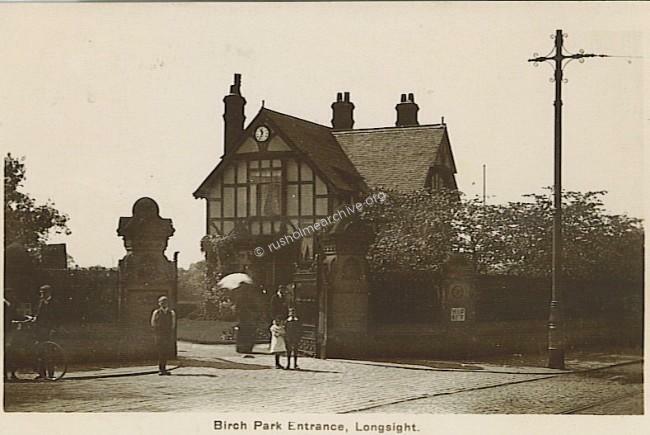 One of the early decisions taken in the park plan was that there should be two principal entrance points, one at the corner of Dickenson Rd/Anson Rd, the Longsight entrance, and another at the corner of Brighton Grove/Birch Grove, the Rusholme entrance. 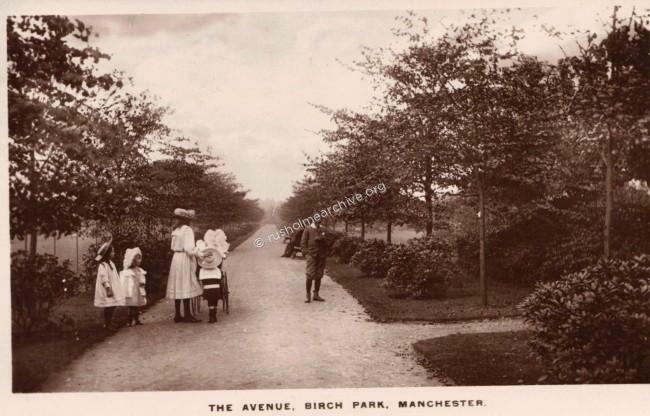 Prince Albert Victor, grandson of Queen Victoria visited Manchester on October 20th 1888, and amongst his various duties that day was the formal opening of Birchfields Park. Albert Victor fell ill with influenza in the great influenza pandemic of 1889–92. He developed pneumonia and died at Sandringham House in Norfolk on 14 January 1892, less than a week after his 28th birthday. The Prince unlocked the gate and passed through an archway onto a platform where he duly announced that the Park was open. At this point the Band should have played the National Anthem but for some unknown reason remained silent. The cheering began to fade so the Chairman of the Parks Committee started to sing the National Anthem and the many spectators joined in singing with the Park Committee Chairman to great effect! 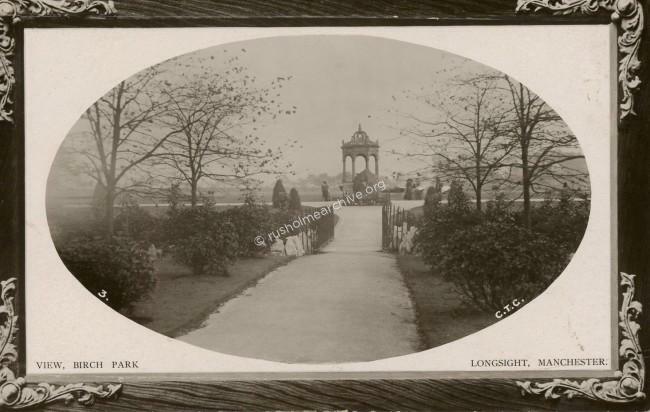 One of the aspects of the development of Public Parks was a concern by the Victorian middle-class that working people spent too much time in public houses! It would be much better if Parks were available where healthy games and opportunities for exercise were available. It was even considered that promenading in the Park was viewed not as just a means to enjoy the environment, but as an opportunity for the lower classes to see their social superiors in public and imitate their behaviour. However this particular aspirational view did not always prevail. Some of the working-class were drinking and gambling in the parks, there were also complaints that young men and women were behaving, too amorously in public, furthermore the games that were being played on Sunday distracted people from attending church. Indeed at one time the Churches had sufficient influence to ensure that all swings etc were padlocked on a Saturday evening so that they could not be used on the Sunday!! The postcard view below is dated 17th November 1916. A substantial crowd is perhaps attending a war-time concert in the park - but the message on the back of the card reports quite ominously that in spite of some foggy nights lately the searchlights have been on all night in the park! It was only two months before that a Zeppelin airship had flown over the North Sea, crossed over the north of England before bombing several villages in Lancashire. It finally dropped several bombs in Bolton killing 13 people; to read more about this story click here. 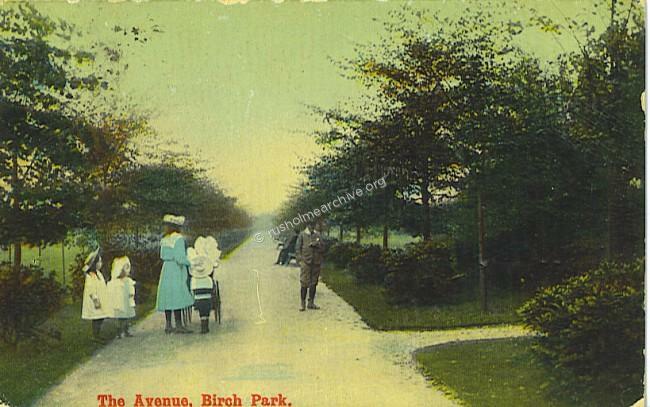 During WW1 the Defence of the Realm Act severely restricted information being published in any form - it is certainly interesting to find from the brief message on this card that Birch Park was being used for searchlight duty in WW1. 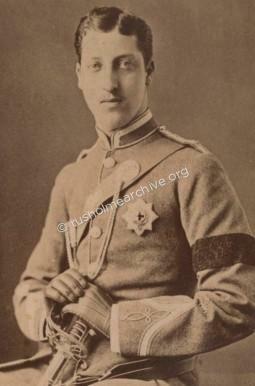 Edward was the eldest son of Queen Victoria and ascended the throne on January 22, 1901 upon Victoria's death. Born in 1841 he had to wait a long time to succeed to the throne. He married Princess Alexandra of Denmark in 1863 who bore him three sons and three daughters. On Saturday 2,000 children assembled at Birch Fields Park, Rusholme, for a Coronation celebration. They sang " All people that on earth do dwell" and "God save the King," and afterwards there was a procession through the streets to a field near Platt Rectory. 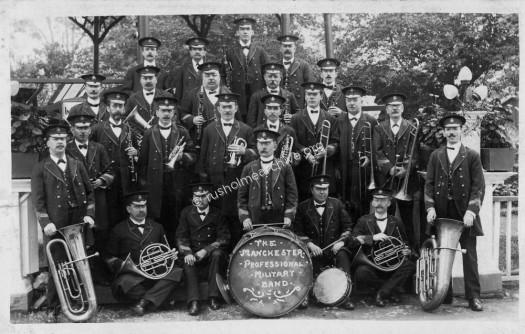 The Birch Band and Ardwick Industrial Band provided music. Toys were distributed to 600 of the younger children, and there were Morris dancers and maypole dancers, a Punch and Judy show, pierrots, an entertainment by Mr Harry Leslie, and sports. The following telegram was despatched to the King's private secretary:—"Two thousand children assembled at Birch Park, Rusholme, Manchester, send a message of love and sympathy to the King and Queen, and pray that His Majesty the King may soon be restored to health and strength.—W. H. BUCKLEY, Chairman." Mr. Buckley yesterday received the following reply from Buckingham Palace:—''Many thanks for your telegram, which will be laid before the King. The Queen thanks you for kind sympathy. His Majesty is progressing most satisfactorily. — KNOLLYS." 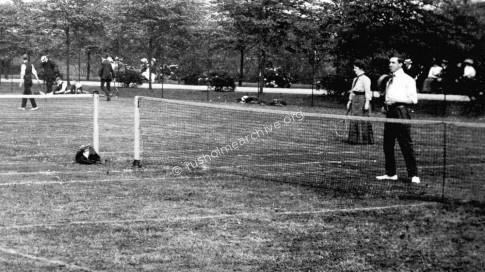 In the postcard below of tennis players in 1909 you can see in the background the Lime tree walk where the trees are only some 20 years old. Clearly tennis was very popular. 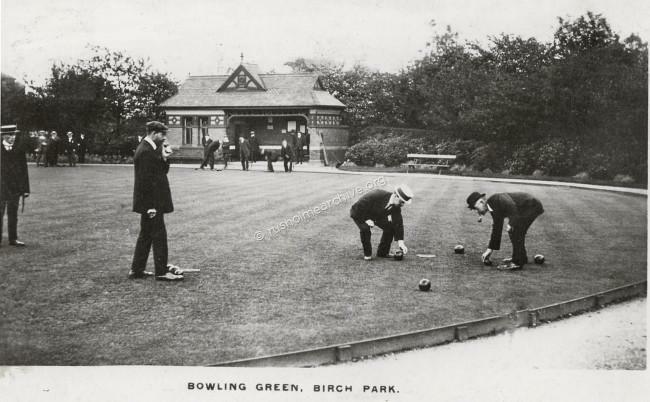 In Mr Pettigrews report below he makes a point of the popularity of the game in Birchfields Park together with bowls. In the close-up image below, (taken from the 1909 postcard above) there is a 'Lady player'. 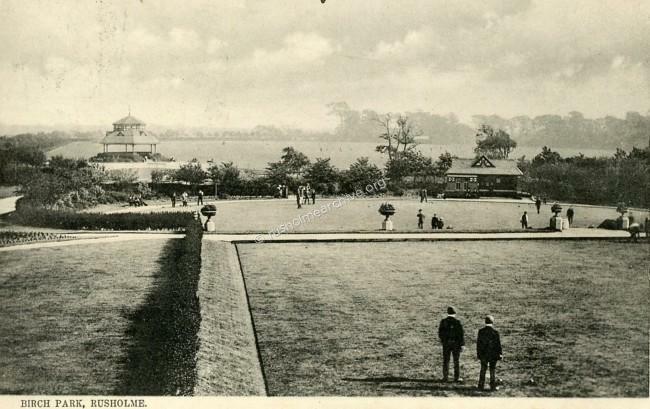 Bowls was a very popular game; In the postcard below, dated 1912, there is a message, "I have never yet had a game of bowls as I have generally gone in for more strenuous games". 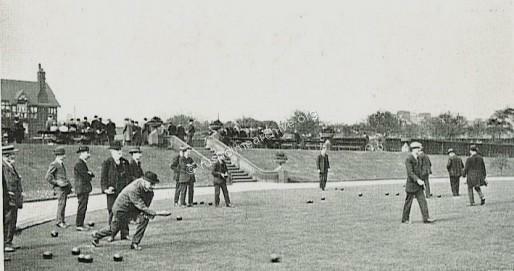 The picture below of men playing bowls is from the 1915 Parks Report. 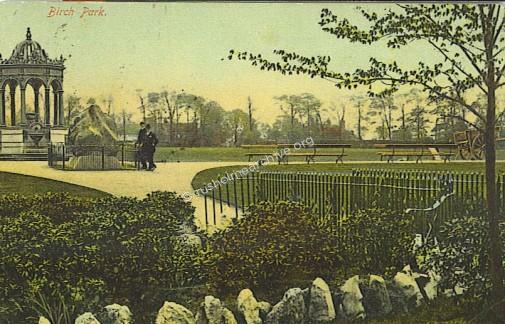 The postcard below is dated May 1913, looking in a southerly direction, on the right a pavilion long demolished and beyond the brook is the bandstand on the left. 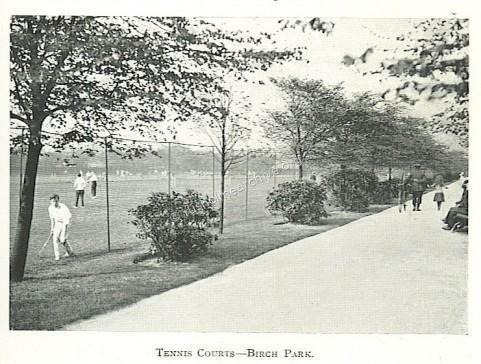 This illustration of the tennis courts at Birchfields Park is also from the 1915 Parks Report. In the view above you can see the comparatively young Lime Trees that make up the favourite walk in the pictures below. 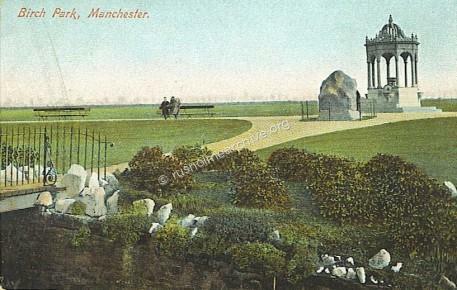 The postcard views below, both in colour and sepia are dated 1908. 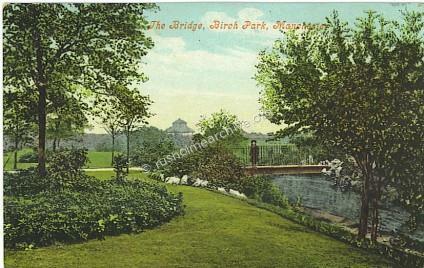 The postcard view below is dated 1926, the trees are looking a little more mature! Gore Brook, as reported below by Mr Pettigrew, Park Superintendant. 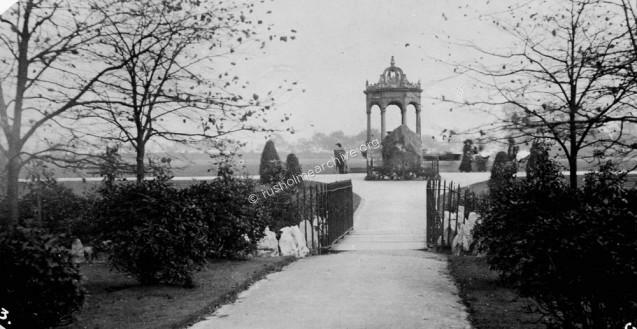 The Bridge over the Brook, in the background is the Bandstand. The fountain & the boulder below. 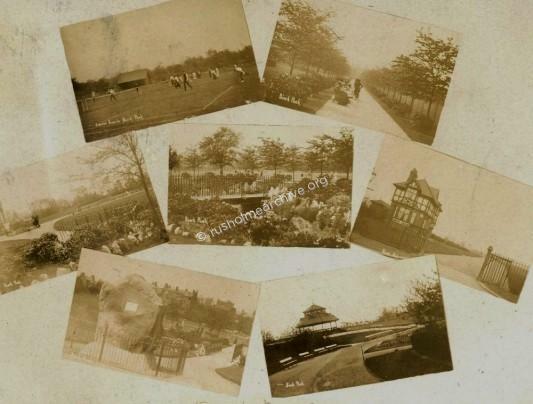 As in the other postcard views of the park there are numerous photographs taken from different positions. 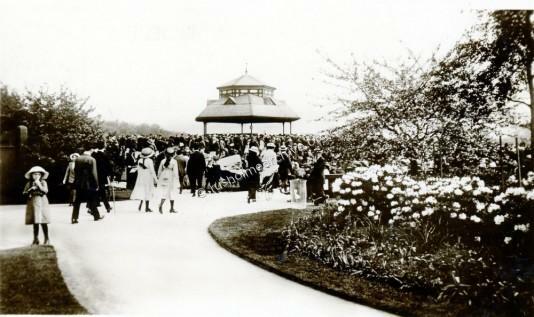 Clearly in Birchfields Park the Fountain and the Bandstand are popular views. In the three views above you can see a large boulder in front of the fountain. The large stone boulder was excavated in nearby Hamilton Road. A plaque had been affixed to the boulder and gave a brief history of this massive piece of stone, but now vandalised the inscription has been stolen. 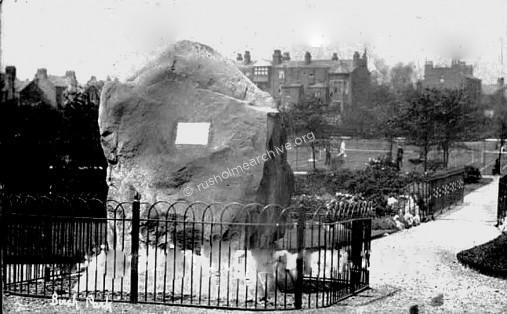 However William Royle provides a history of the boulder, and how it came to be placed in Birch Park. Below is the extract from his book. Postcard view below is dated 1906. Rather a poor quality image and I think that sunlight must have caught the plaque, nevertheless an interesting image. The boulder is surrounded by fencing and across the bridge over the brook you can see the tennis courts. Beyond that are the large houses on the southerly side of Birch Polygon, one of which, 'Elmhurst' was the home of William Royle. I think that these houses were demolished in the 1960's. 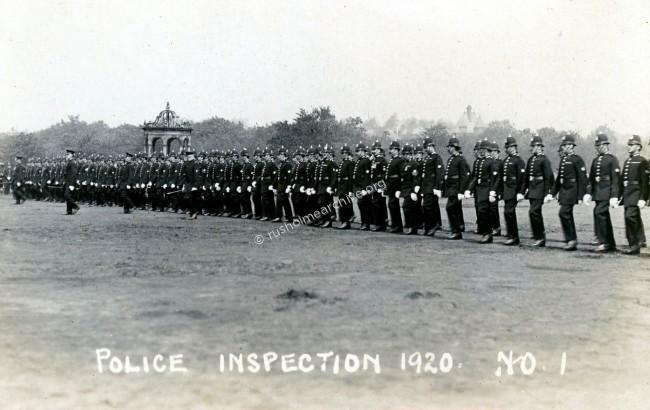 Photo below, Police Inspection 1920 Birch Park, looking in a northerly direction towards Dickenson Road). 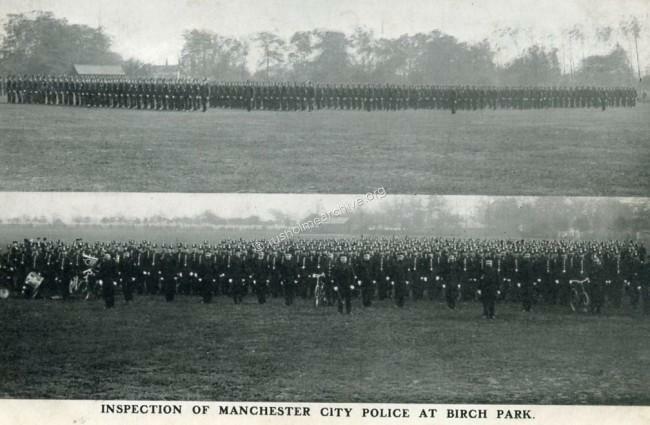 Sir Robert Peacock, Chief Constable of Manchester City Police, takes part in an inspection of the Force in 1920. Sir Robert lived in a large house, Park View, 145 Dickenson Road that over-looked Birch Fields Park. In the background, (rather faintly), is the house that was known as the pepper-pot - the Chief Constables home was to the left. Perhaps one of the most remarkable police officers of his age, Sir Robert Peacock was born in Northumberland in 1859. He joined the police in Bradford in 1867 and displayed qualities that saw him rise rapidly through the ranks. By 1888, at the age of 29, he was Chief Constable of Canterbury. He went on to command the Oldham Borough Police before taking up the role of Chief Constable of Manchester in 1898. Sir Robert commanded the force for the next 28 years and was considered a remarkable and very forward-looking officer by his peers. Described by the Manchester Guardian as the doyen of chief constables, he served at total of 40 years in the rank, dying in office in 1926. Below is a compendium postcard view. World War 2 Barrage Balloon in Birch Park. 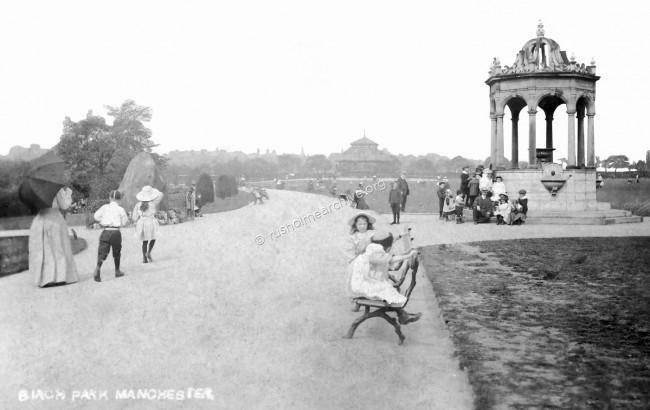 This image of a balloon in the park is part of the Manchester Libraries 'Image' collection. If you follow the link below you can see the image, do not forget to click your back button on your browser to return to this website! Views towards Dickenson Road entrance below are interesting below because you can see in the background on the left and the right large houses on the edge of Victoria Park. 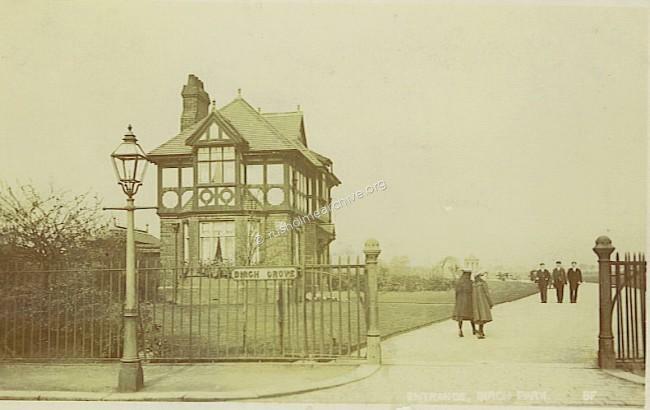 Both of these houses were demolished circa 1920 to make way for Anson Parade, the shops that line Dickenson road either side of Anson Road.